1 Department of Speech, Language and Hearing Sciences, University of Colorado at Boulder, Boulder, Colorado. This study investigates the amount of language available to children in the home environment and a summer preschool program. The purpose of this study was twofold. First, the study sought to gain information about patterns of language use among families of preschoolers with hearing loss. Additionally, the project was designed to provide an initial investigation into the impact of reduced educational programming over summer months for children with hearing loss. Children with varying degrees of hearing loss were enrolled in an auditory-oral 6-week part-time program. 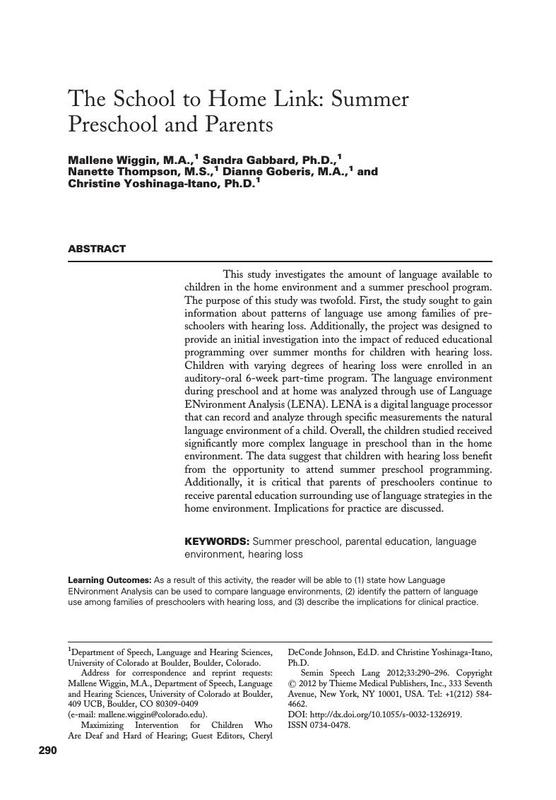 The language environment during preschool and at home was analyzed through use of Language ENvironment Analysis (LENA). LENA is a digital language processor that can record and analyze through specific measurements the natural language environment of a child. Overall, the children studied received significantly more complex language in preschool than in the home environment. The data suggest that children with hearing loss benefit from the opportunity to attend summer preschool programming. Additionally, it is critical that parents of preschoolers continue to receive parental education surrounding use of language strategies in the home environment. Implications for practice are discussed.